Stainless Steel moka pots are a great alternative to the traditional aluminum stovetop espresso makers that have been on the market for generations. For those who are health conscious and are concerned about using aluminum when other options are available this is a no-brainer. Are you worried about the negative health ramifications of using aluminum in your kitchen? You wouldn’t be alone if you said yes. Stainless moka pots are stronger and more durable than aluminum models and they have no health questions surrounding them. 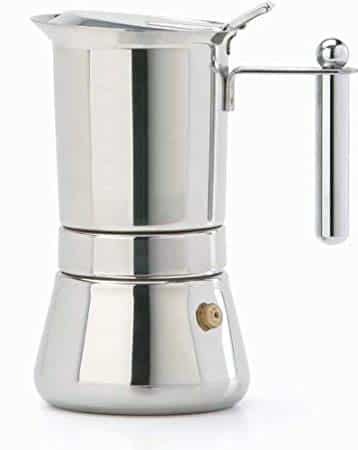 Although they do not have the classic build and do not generate the timeless taste of an aluminum model some of these are still among the best stovetop espresso makers made today. 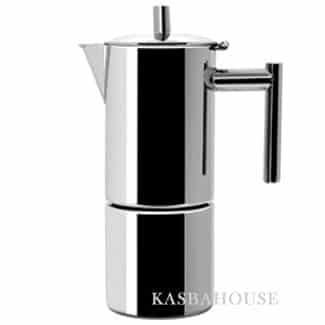 For me I would consider using a steel espresso pot over an aluminum one for the main reason to ensure I don’t have to deal with the seasoning of an aluminum pot which is necessary to overcome the metallic taste issues which can be common in unseasoned moka pots made of aluminum. Why Are Stainless Steel Stovetop Moka Pots Better Than Aluminum? For starters this is not a fact.Many people believe that stainless moka pots are inferior and needlessly cost more money. However, stainless steel doesn’t impart that metallic taste that is common with other metals so it’s a dream for people who just can’t stomach rinsing their stovetop espresso maker out after every use and never using soap on it. I can understand this concern for sure because sometimes I wait uncomfortably long before rinsing the espresso maker out. During times like this I am frequently tempted to give it a good scouring. The other main reason for me why stainless is better is because of durability. Steel simply holds up to bumps, dents, and scratches better than just about anything over time. Although most stovetop espresso makers are made from aluminum there are quite a few stainless steel moka pots to choose from as well. 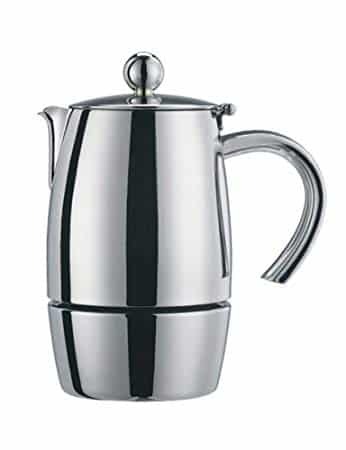 I’ve tried to list some of the best steel espresso pots from the bestsellers lists for your convenience. Some of these I’ve used and others I haven’t but they are all top rated espresso makers. Does a Stovetop Espresso Maker Make Real Espresso? One thing that I must point out for those unfamiliar with stovetop espresso is this – stovetop espresso is very different from the espresso made in a steam or pump espresso machine. If you were to compare the output from a super automatic espresso machine and the output from a Bialetti Moka Pot you would find the two to be totally different. If you were to imagine brewing the darkest and strongest coffee possible you would be getting close to moka but the character of true espresso just isn’t found in moka. It’s different. You don’t get the crema, you don’t usually get the cherry in nearly the same way, and the speed of the brewing method changes things quite a bit too. Make sure you go for a real espresso maker if that’s what you are looking for otherwise open yourself up to something new and enjoy. 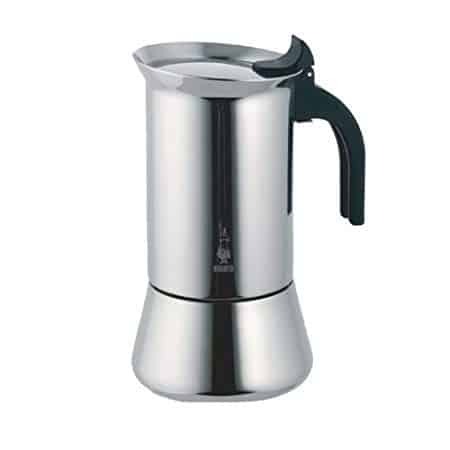 Lastly, if you’re not set on getting stainless steel and are open to picking up an aluminum model then be sure to check out our list of best moka pots here or the store for a wide variety of coffee accessories. There’s no denying that the moka pot is a staple kitchen home equipment. Whether the household is a regular coffee drinker or not, having a simple brewing machine is handy. You can easily prop it atop the stove and brew away. But not all moka pots are the same. If you want to invest on a new moka pot or planning to buy your first stovetop espresso, here are some important factors to think about. Who is the manufacturer? Europeans know their coffee well. And if you will make a background check, the Italians are known as the best brew machine manufacturer. Choosing an espresso maker made from Italy will give you an idea that you can have quality espresso style coffee every time. If you choose otherwise, at least you have been warned. How much coffee can the moka pot hold? Check the volume of coffee that the stovetop can yield. Some models can make single serving, which is good enough if you are leaving alone or you are the only person in the house who loves coffee and espresso. But if you have a partner, entertaining guests frequently or a medium-sized family, get a stovetop maker that can accommodate at least 4 cups of coffee. This will be good enough for a small group. There are larger size stovetop espresso makers when really needed. Is it compatible to any stove? Some stovetop makers require electric or induction stove. Always check this because it will be frustrating to take home a stovetop maker that will never work on your stove. Is it made from stainless steel? Do you prefer aluminum or stainless steel? Aluminum is not as shiny and elegant as stainless steel, but it is more affordable and slower conductor of heat. Stainless steel is eye-catching but conducts heat fast so be careful when touching the handle. What are the reviews about it? If you really want honest to goodness feedback, read reviews of the product you want and check praises and complaints about the stovetop espresso maker you are planning to buy. If you and your family love coffee in the morning, your moka pot will be one hardworking machine. This is just one reason why you need a durable and long lasting. What are the other benefits of getting a stainless steel moka pot? Stainless steel moka pots are built to last. It is very durable and can sustain every day use, bumps and falls. Stainless steel is good-looking. It always look shiny and new. With proper care and cleaning, it can extend for years and still looking good as the first time you buy it. It never goes out of style. Manufacturers love to experiment with design. 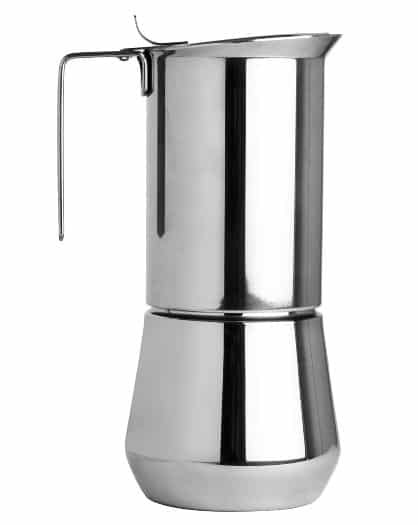 But if you have a stainless steel moka pot, it will always be in style. This is one of the most-loved model of Bialetti brand. Many users loved its durable and sturdy built. It was a good investment for most of the buyers. This is one respected model and brand. It has an ergonomic design that is elegant and functional. It looks good on your countertop plus it is efficient for single serve coffee brewing. If you are looking for just the right size of moka pot, check the AMFOCUS model. It is handy and makes two perfect cup of coffee. It is easy to clean and easy to maintain for morning brew. 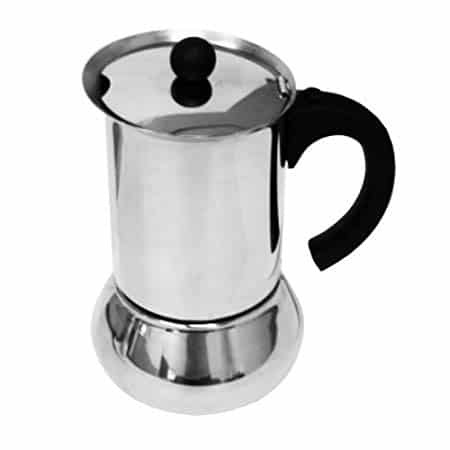 This is a large moka pot that suits a large family or a group of people, maybe in the office or camping outdoors. It is very versatile and portable, perfect for having coffee even away from home. Just make sure you have a suitable source of heat. Also made in Italy, you know you are getting a good one. Just like the Bialetti, it has an efficient design and makes perfect cup of brewed coffee. Buyers love the fact that everything is made of stainless steel, except for the gasket, of course.